Mudras occupy an important place in Buddhist and Hindu religious practices as these signify special meanings, associated with specific divinities, associated with specific divinities and rites, which cannot be represented any other way. 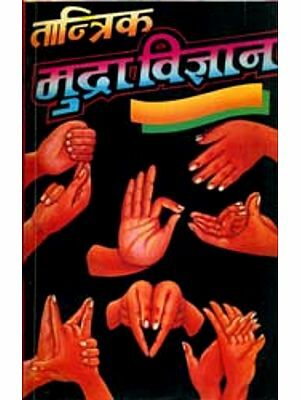 This book is a dictionary of mudras in Hindu and Buddhist religious practices that lists the various mudras  deity-centre, rite-centred, yogic-centred, and so on illustrating each with a simple drawing drawn generally from the perspective of one holding the mudras. It contains references to literary and other source that reveal a lot about the mudras  their description in the texts, rites associated with the mudras in the text as well as the varied interpretations of a number of mudras in the different texts. The book also has an introduction on Hindu and Buddhist mudras that goes into iconographic features associated with deities along with technical descriptions and the subcategories and further divisions into which mudras are arranged. It scrutinises the work done by a number of scholars on the subject to throw further light on the subject. The volume will prove indispensable to all students and scholars who are engaged in study of Hindi and Buddhist religious traditions and practices. · Buddhist Textile of Laos, Lan Na and the Isan  The Iconography of Design Elements. · A Dictionary of Buddhist and Hindu Iconography. · An Encyclopaedia of Buddhist Deities, Demigods, Godlings, Saints and Demons (2 vols.). · An Encyclopaedia of Hindu Deities, Demigods, Godlings, Demons and Heroes (3 vols.). · The Iconography of Architectural Plans  A Study of the Influence of Buddhist and Hinduism on Plans of South and Southeast Asia. · Islamic Tombs in India  The Iconographical and Genesis of their Design. · Monuments of India and the Indianized States. · The Mosques of the Indian Subcontinent  Their Development and Iconography. · Numbers  Their Iconographic Consideration in Buddhist and Hindu Practices. · Royal Palaces, Residences and Pavilions of India  An Iconographic Consideration. · The Sacred Dichotomy: Thoughts and Comments on The Duality of Female and Male Iconography in South Asia and the Mediterranean. · The Tibetan Iconography of Buddhas, Bodhisattvas and other Deities  A Unique Pantheon. · The Yantra of Deities and their Numerological Foundations  An Iconographic Consideration. The genesis of this compilation has come from three works which the author had previously published-i.e., An Encyclopaedia of Buddhist Deities, Demigods, Godlings, Saints and Demons: With Special focus on Iconographic Attributes; A Dictionary of Buddhist and Hindu Iconography-Illustrated-Objects, Devices, Concepts, Rites and Related Terms; and An Encyclopaedia of Hindu Deities, Demigods, Godlings Demons and Heroes; with Special Focus on Iconographic Attributes. It was noted that there were a number of mudra which were specifically assigned to the deities of the two pantheons. Also, a number of these mudra were identical to those practiced by Tibetan, Chinese and Japanese Buddhist (Vajrayana, Mantrayana) Traditions and held or formed by a devotee or priest during various rites, as well as various yogic and dramatic practices. Indentical, but frequently with different terms or names. It was decided to compile the hundreds of mudra-i.e., deity centered, rite centered, yogic centered and dramatic centered-in one volume and to illustrated each. In so doing, it is to noted that there are numerous citations. Some may feel that the notes are inordinate in their profusion. However, they were included so that the reader may easily: refer to the proper locations, become aware of the varied interpretations of a number of mudra, and be made aware of clarifying additions made by the author. 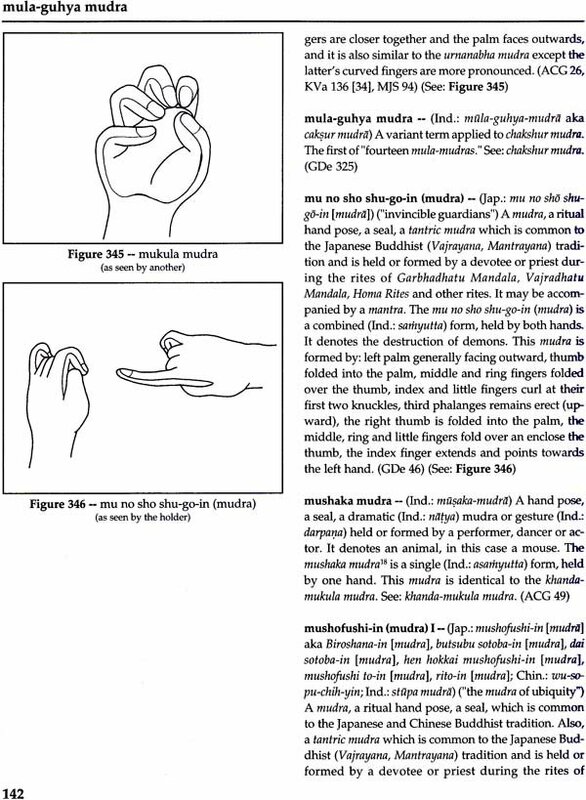 It was decided to illustrate the mudra with drawings for ease of identification. 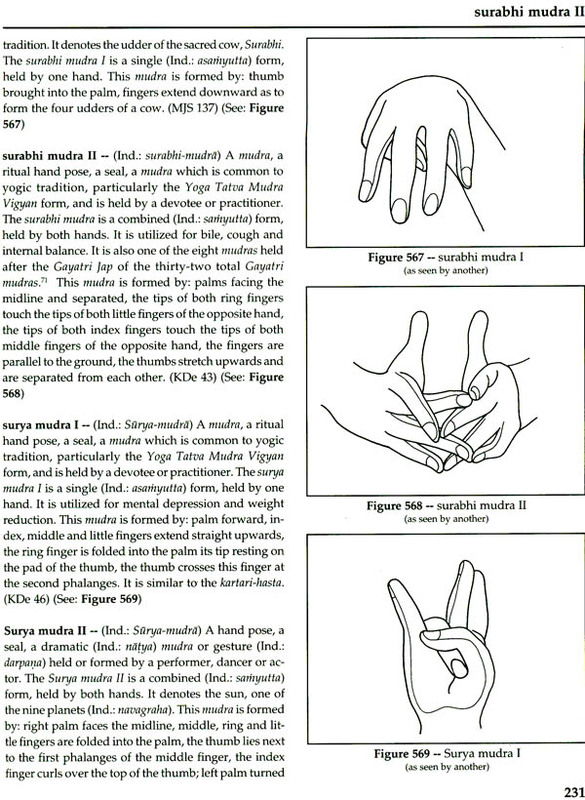 Each unique mudra is illustrated by an individual drawing. The drawings are generally drawn from the perspective of the one holding the mudra, except in those instances where it was deemed more illustrative to draw the mudra from the viewer's standpoint. >From the mundane to the esoteric, from the sacred to the profane, from the religious to the secular, symbols, iconographs, have been part of the human repertoire since time in memorium. Some of the earliest elements of iconography are to be seen in pertoglyphs and paintings preserved on the walls of caves. Whatever humankind has touched or made can be seen as a symbol. Symbols of wealth and power may be the most ostentatious-from an emerald necklace to a Rolls Royce, or a villa on the Riviera. Conspicuous consumption sets one group part from another, the "have" from the "have notes," the wealthy from the less wealthy or poor. Symbols of rank may be viewed in various circumstances-e.g., the cut and shape of an academic hood worn during formal ceremonies, the shape, size and adornment of the coronets of peers worn during a coronation; and in Southeast Asia the wearing of yellow clothing has been and still is reserved for royalty (sultans) and their immediate family. There are symbols which have been associated with vocation-e.g., a needle and thread with a tailor, or a hammer and saw with a carpenter. A flat brimmed, high crown bowler-like hat identifies Peruvian Indians, or a full feathered headdress with feathered trailer signifies members of the Sioux Tribe. all are symbols of belonging and affiliation. These secular symbols and the myriad others have been overshadowed by religious symbols. This is particularly true in the visual arts. There are a number of iconographic features associated with both Buddhist and Hindu deities with rather precise, technical meanings and/or descriptions. Terms which apply when vajra (Ind. ; Tib. : rdor-rje) refers to a diamond or adamantine scepter which is symbolic of indestructibility and the wisdom which destroys passion. Its form is rather precise, allowing architectural form that is synonymous with Buddhism; or a trident (Ind. : trisula; Tib. : rtsegsum) which is more often seen in Hindu iconography. The various devices with characteristics unique to their practices are, indeed numerous and sometimes rather complicated. Iconic attributes are not limited to objects held or worn, but also apply to bodily forms as well. Among the most important of these traits are the positions-i.e., ritual positions-held by the hands(s) of the various deities-i.e., mudras or hastas? Mudras, or hand positions are not the sole province of either the Hindu (Brahmanic) or Buddhist religions. In Christianity hand positions are often a telling feature of the Deity or of a saint. Frequently the Lord Christ is shown with right hand raised, his index and middle fingers extended upwards, his ring and little fingers folded into the palm and the thumb overlapping the latter two. This is known as a symbol of grace or benediction or of forgiveness. Likewise, a female saint may be depicted with their hands crossed over her breasts. This is particularly true of martyrs. That hand position signifies resignation and the acceptance of the will of God. Also, this latter position is often seen to be held by body of a deceased in the Christian tradition. The meaning is the same-acceptance of God's will. Very often Buddhist and Hindu mudras indicate the character of the deity and in most cases they are a great aid in identifying the particular deity in question. In addition, a number of the mudras-i.e., Tantric mudras-are held by the devotees and/or the priests/lamas who are participating in a specific ceremony. For the casual observer or devotee the presentation in either two-or three-dimensional form of a deity, whether Buddhist or Hindu, is important. The various technical terms that are applied to the deity are, in most cases, of little interest to these casual spectators. For the student/researcher of religious practices, these technical/descriptive terms began assume some tangible and/or iconic importance. Mudras can be arranged into four subcategories-i.e.,1) those which are general held or depicted in the representation of deities, demigods, godlings, demons and heroes, both Buddhist and hindu,2) those which are associated with particular tantric worship, particularly of Japanese, Chinese and Tibetan Vajrayana or Mantrayana rites,3) those which are associated with yogic meditational practices, and 4) those which are associated with dramatic practices, including dance. There are a number of mudras which are unique to or are strictly deity-centered-e.g., dharmacakra-mudra or varjrahumkara-mudra-others are similar or identical with deity-centered mudras, but with different titles or names-e.g., pataka-mudras (abhaya-mudras) or the drama oriented suchi-mudra (trajani-mudra)-and still others which are unique to tantric, yogi and dramatic practices. The first category, those associated with specific deities, is rather finite-amounting to a few score positions. It is within the category of tantric rites, particularly as practiced in Japan, that hand positions. It is within the category of tantric rites, particularly as practices in Japan, that hand position multiply to the hundreds. 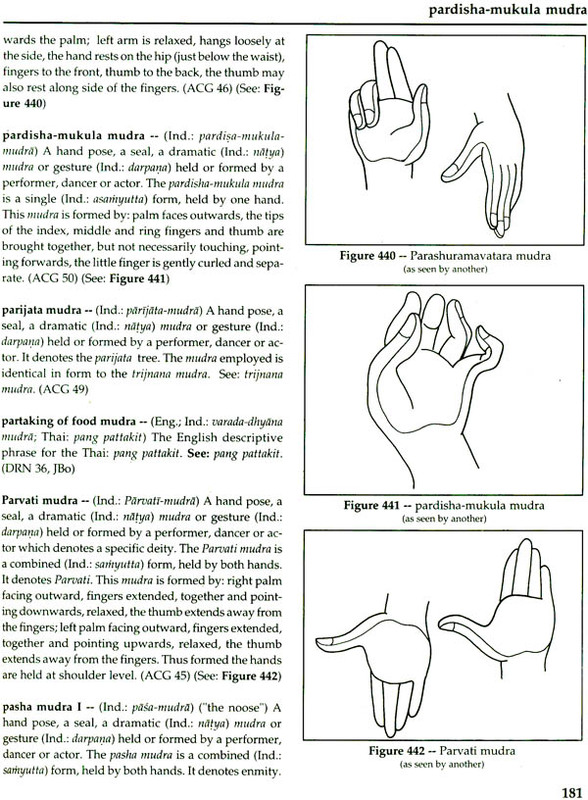 Within these four subcategories the mudras may be further delineated into single hand (Ind. : asamyutta) and combined (Ind. : samyutta) or two-handed mudras. Single hand, "static" positions predominates within the first-i.e., the deity centered-group. That is not to say that mudras involving both hands, combined mudras, do not form an important part within this category. 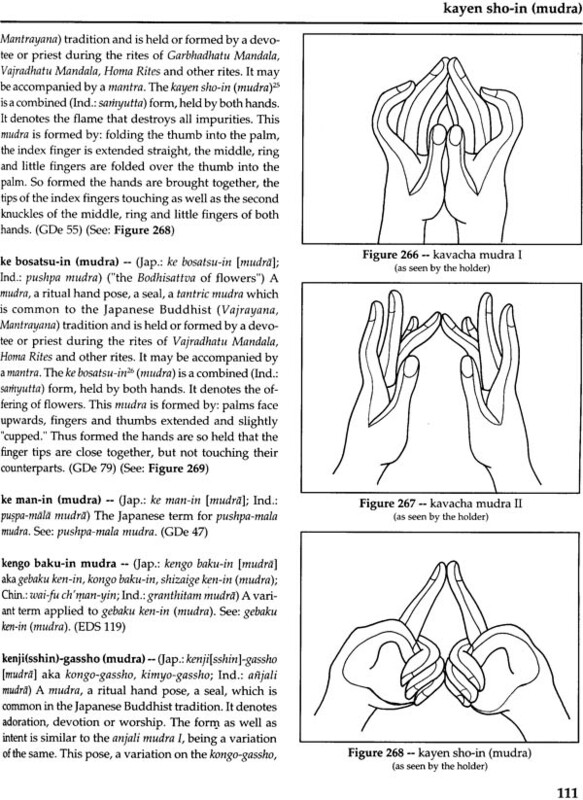 When one merely considers the possible variations of a single fist the myriad of possible mudras is truly staggering-e.g., 1) fist with thumb placed on the third phalange of the index finger, 2) fist with thumb placed on the second phalange of the index finger, 3) fist with thumb placed on the first phalange of the index finder, 4) fist with thumb folded inside the fingers, 5) fist with thumb folded inside the fingers and the index finger curled so that its nail rests on the second phalanges of the thumb, etc., etc., etc. Among the latter three categories single hand mudras do exist and are of some importance. However, within these categories the combined-form mudras proliferates. 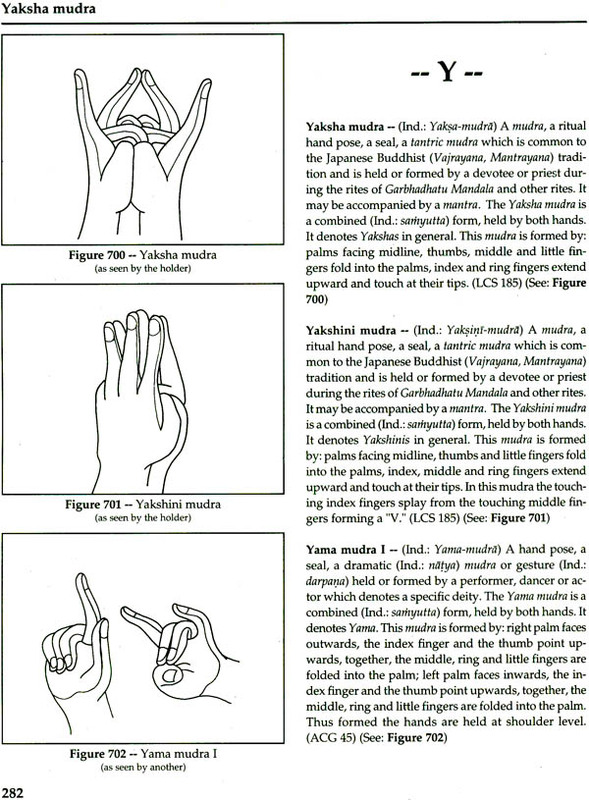 In tantric, yogic and dramatic practices, mudras are formed and movement is frequently required to fulfill the tenets of the particular mudra-i.e., within the rites of Tendai Buddhism of Japan the "Hak-Ken: Mudra for sending off the Vision" requires a triple "flicking motion" of the index fingers. 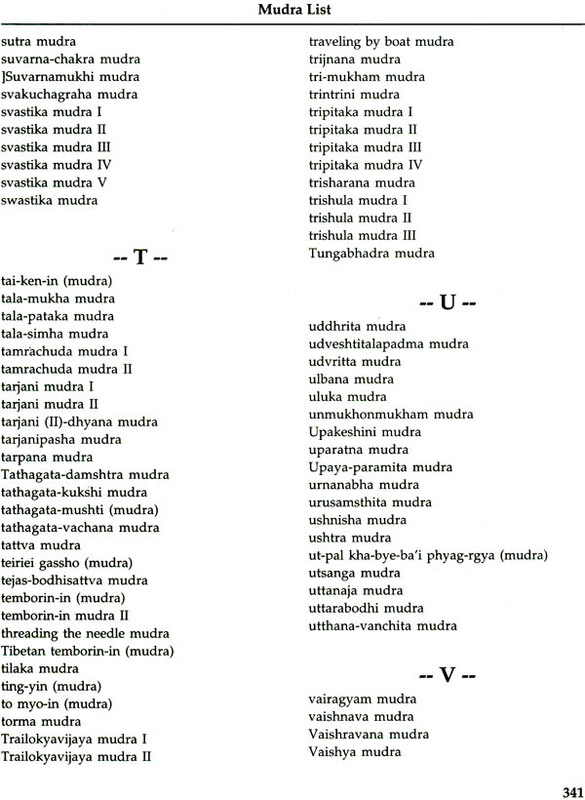 In considering just two works-i.e., Lokesh Chandra and Sharada Rani, Mudras in Japan: etc. 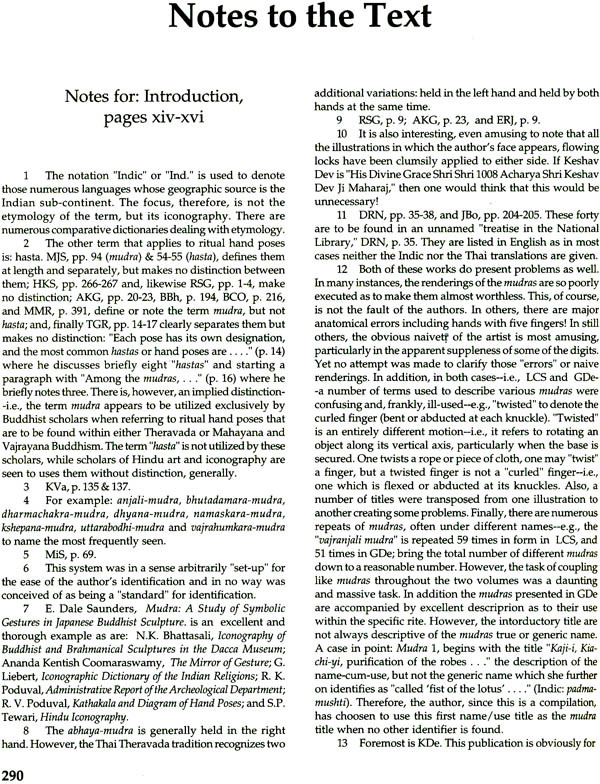 and Gauri Devi, Esoteric Mudras of Japan: etc.-1,811 separate illustrations needed to be considered. A large number were repeated. 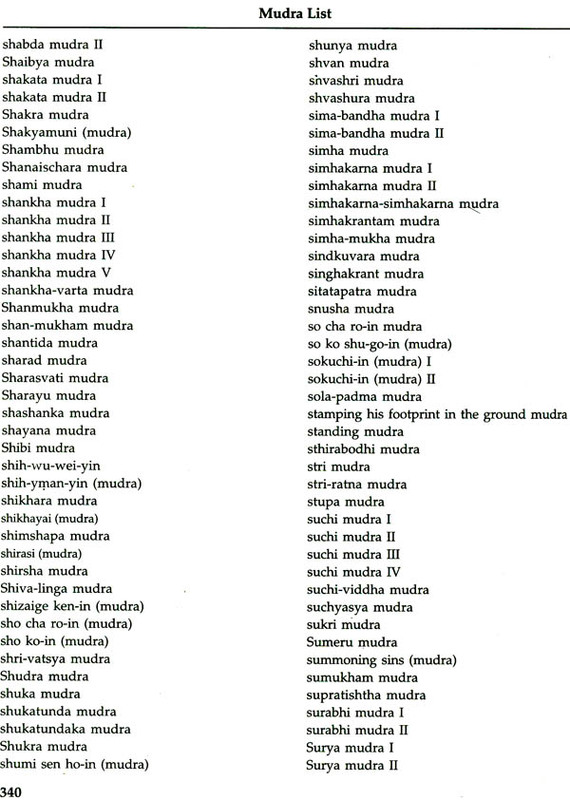 In the case of the "vajranjali-mudra," it was duplicated one-hundred-seventeen times in the two works. A system was needed to facilitate the ease of identification of these 1,811 illustrations. They may be grouped into approximately 4630 different and distinct mudras. 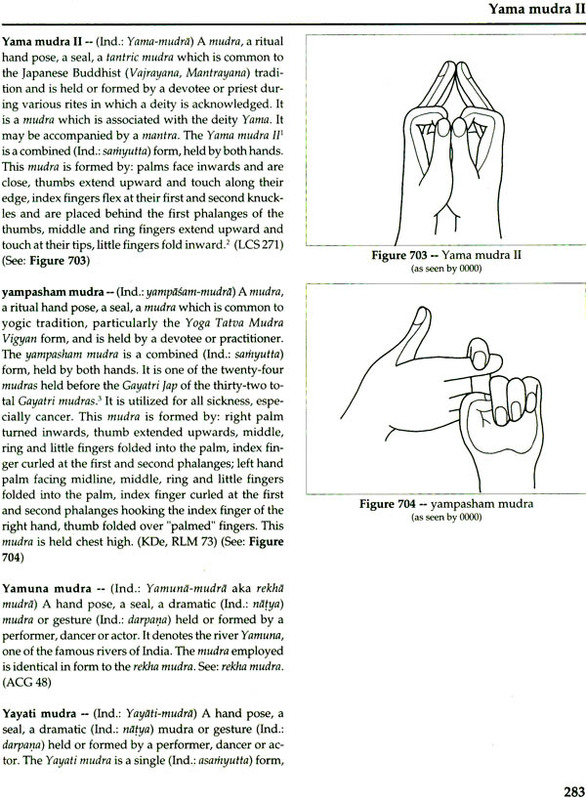 This identification system involved first: single, double or combination mudras and their variations. 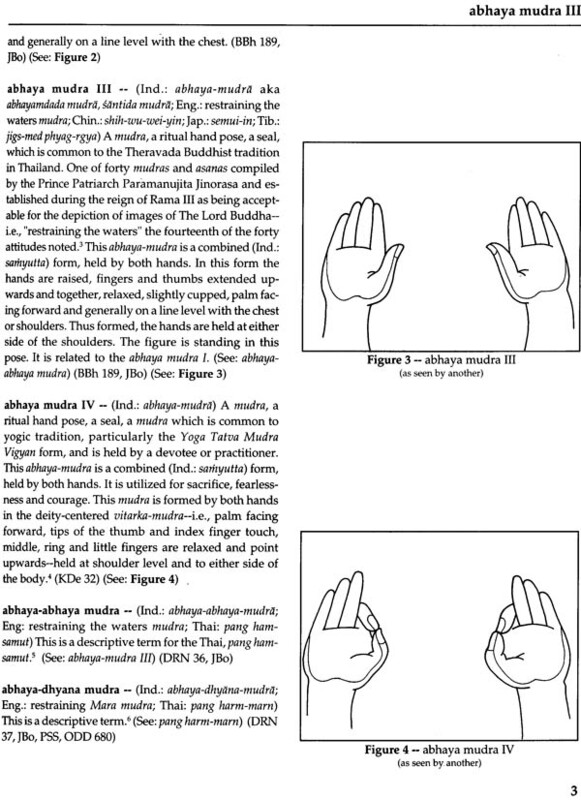 Single and mudras are:1) fist-type mudras: those in which three or more finger (including the thumb) are brought into or in close proximity with the palm, 2) open hand-type mudras: those in which two or less fingers (including the thumb) are brought into or in close proximity with the palm, and 3) others: single hand mudras which to not conform to the two variations noted above. 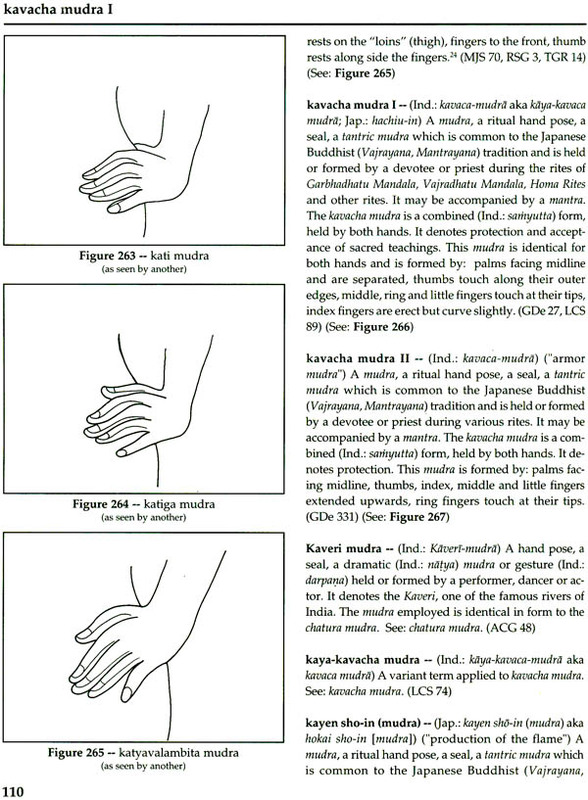 Double or combination hand mudras are:1)Inner fist-type mudras ("Inner Bonds Fist" [Jap. : naibaku ken-in]): in which three or more fingers (including the thumb) are interlaced and are folded into the palm of the hand, 2) outer fist-type mudras ("Outer Bonds [Jap. : gebaku ken-in]): in which three or more fingers (including the thumb) are interlaced and rest on the back of the hand, 3) anjali-type mudras: where hands are brought together, palm towards palm, the finger are extended upwards and tips generally touch or are in close proximity, 4) stupa-type mudras: similar to the anjali-type except, the thumbs rest together and point upwards, and the tips of the forefingers touch the tips of the thumbs in various manner (i.e., tips-to-tips, tips, tips of the index fingers in front of the tips of the thumbs, or tips of the index finger behind of the tips of the thumbs), 5) dhyana-type mudras: where one hand rests upon the other, the fingers generally extended in some manner, and 6) Others: double or combination-type mudras which to not conform to the five double variations noted above. There are numerous English sources which in part deal with these myriad iconic features in greater or lesser detail. There are, on the other hand, isolated studies which are quite detailed. 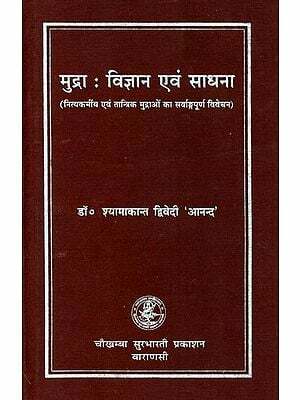 For the student/researcher these sources become quite important, particularly if he or she is not acquainted or fluent in the languages of the numerous prime sources-e.g., Sanskrit, Tibetan, Japanese, Chinese, Mongolian, etc. Clarity of description assumes the level of a rime concern. Discrepancies within the descriptive passages become highly problematical. It becomes obvious in consulting the various sources available that there is, if not a discrepancy or confusion, at least some variation(s) which exists between the written term and the visualized or drawn mudras and / or asanas. When confronting the term "anjali mudras" brings forth seemingly insoluble conundrums-i.e., there are described and/or shown three distinct forms which are related only through the use of the descriptive terms "salutation," greeting," or "worship." Another problematical pose is the vyakhyana mudra. It is described as similar or another name for: the dharmachakra mudras, the chin mudra, or thee vitarka mudra. Such problems are not isolated to the various mudras. In a similar manner, this apparent confusion or discrepancy also can be seen in asanas. The asana known as ardhaparyankasana is seen by some as a seated position while others view it as a standing position. Even the pose known as alidhasana, which is generally seen as a standing pose related to shooting a bow and arrow, is by one source named as a seated posture! There were a number of problems which arose in the process of this compilation. Numerous descriptions found in A. Coomaraswamy, The Mirror of Gesture, were ambiguous and confusing. The importance of this work is not to be discounted, however, there are a number of confusing descriptions. 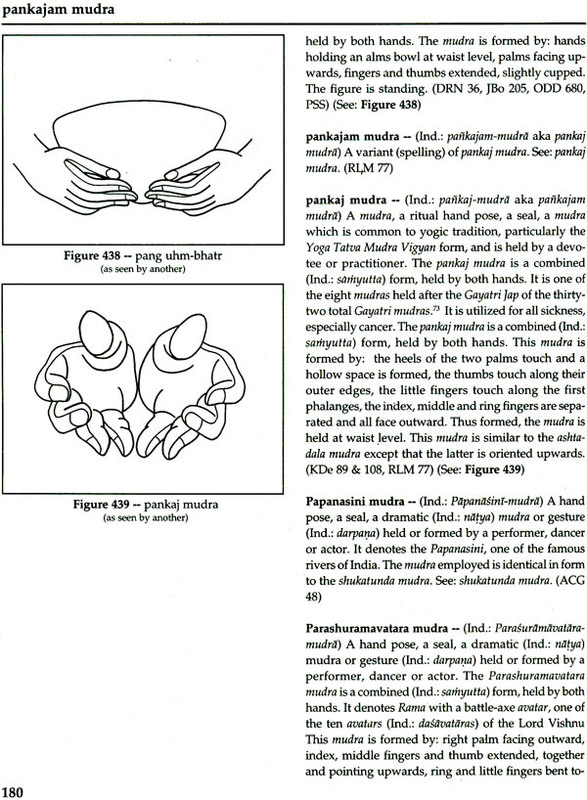 Nonetheless, problems with the description were plentiful-e.g., regarding mudras entitled: "Aviddha-vakra (swinging curve):..Pataka hands are shown with grace and with (movement of) the elbows" or "Nitamba (buttocks): Pataka hands face upwards, turned over, (extended from) the shoulder to the buttocks." In supplying a clear verbal description the "usage(s) " were taken into account and certain "leaps of faith" hand to be made. These interpretational descriptions are duly noted. In the two works which display hundreds of esoteric Japanese Mantrayana mudras-i.e., Gauri Devi, Esoteric Mudras of Japan: etc., and Lokesh Chandra and Sharada Rani, Mudras in Japan: etc.-numerous mudras were not entitled-e.g., LCS, pp., 64#1.32, 116 #2,175, 174# 3.144-3.146, etc.-while there were mudras which bore titles that described their particular use during the various rites (in many cases there was conflict)-e.g., GDe, p. 166, "Mudra of Ratna Bodhisttva (i.e. of Vajraratna)," and the identical mudra on p. 178," Mudra of Arya Avalokitesvara, no.2," and again the identical mudra in LCS, p. 114, # 2.167, "Vajraraksa bidhisattva," and still further, the identical mudras on p. 259, # 4.180" Mudra of the edict of gods on earth." In none of these last four mudras was the gesture given either a Japanese or Indic name! 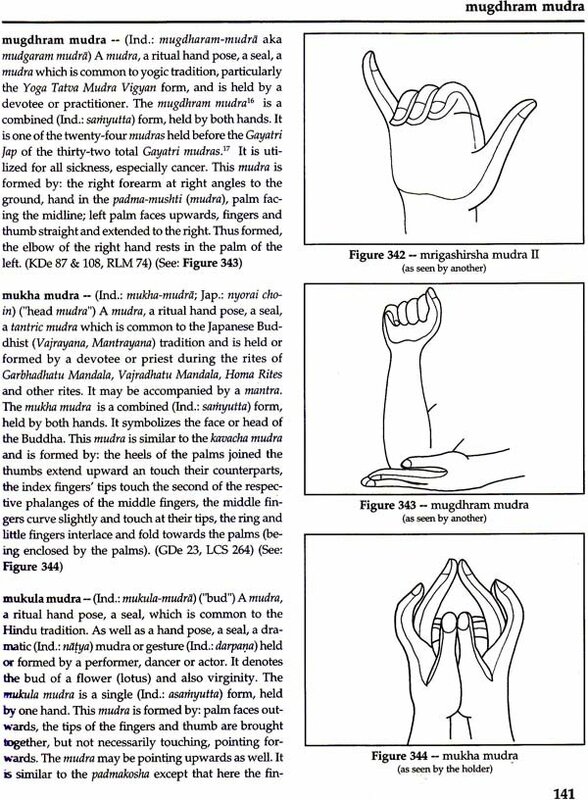 Luckily, the mudras is virtually identical to the uttarabodhi noted and illustrated in a number of sources. Finally, a number of sources, particularly secondary sources, possess apparent errors which cannot be attributed to the prime sources, rut to lack of adequate proofing. The publication: Mudra Vigyan  A Way of Life, indicates a number of spelling errors or un-noted variations-e.g., "sinhakrant" (p. 53), "shinghakrant" (p.86) and "singhakrant" (p. 108) all for the same mudra; "veragya" (pp.27 & 108) and "veiragya" (p.88). To say that any publication is without typographical or proofing error would be vain, however, every effort should be made to present as consistent a work as possible. Further, there are forty mudras established during the reign of Rama III as being acceptable for the depiction of images of The Lord Buddha. 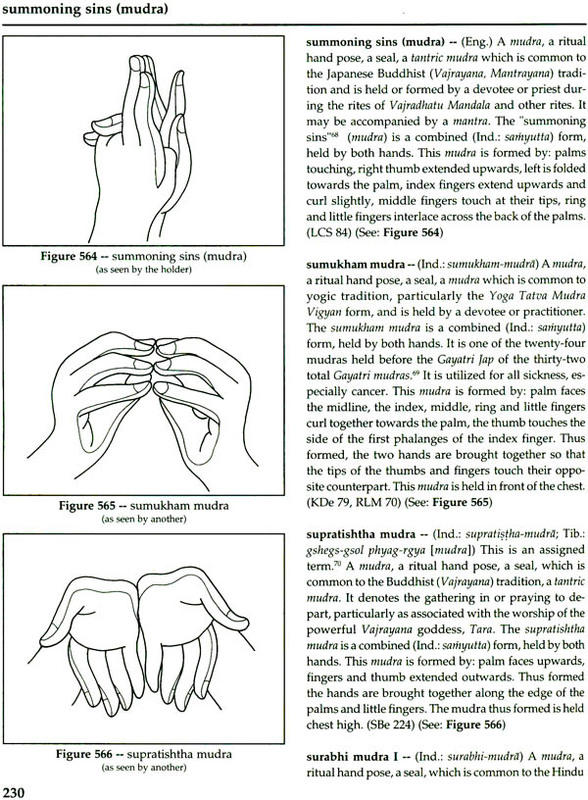 These mudras do not necessarily find referents to traditional Hindu or Mahayana Buddhist mudras. 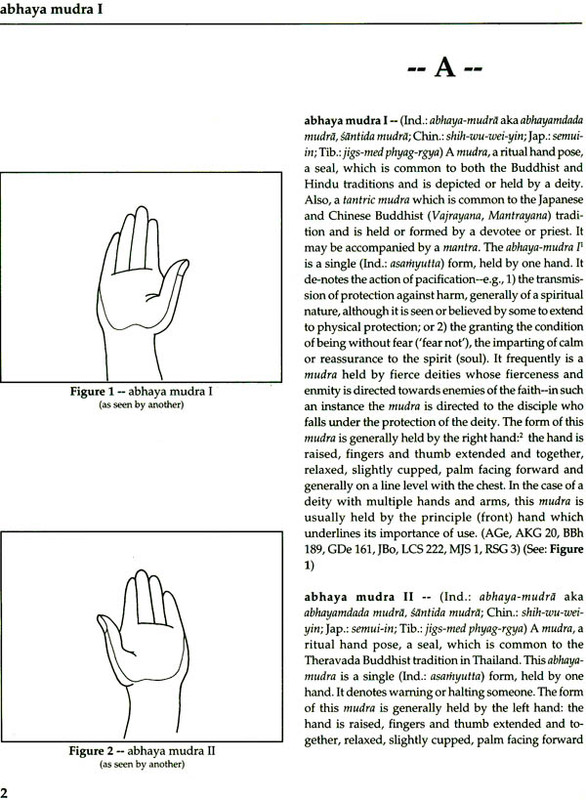 Further, in many cases, the mudras find no referents to Indic terms. How then are they to be categorized and / or entitled? This study, this compilation, therefore, utilizes as its parameters those studies which have gone before, particularly sources in English. A number of works assume major importance-e.g., Lokesh Chandra and Sharada Rani, Mudras in Japan: etc. ; and Gauri Devi, Esoteric Mudras of Japan: etc.-if nothing else, because of the sheer mass of information contained. Others, consulted are for popular consumption, but offer important or rarely seen mudras. In addition, where there are variations, they too, are listed. 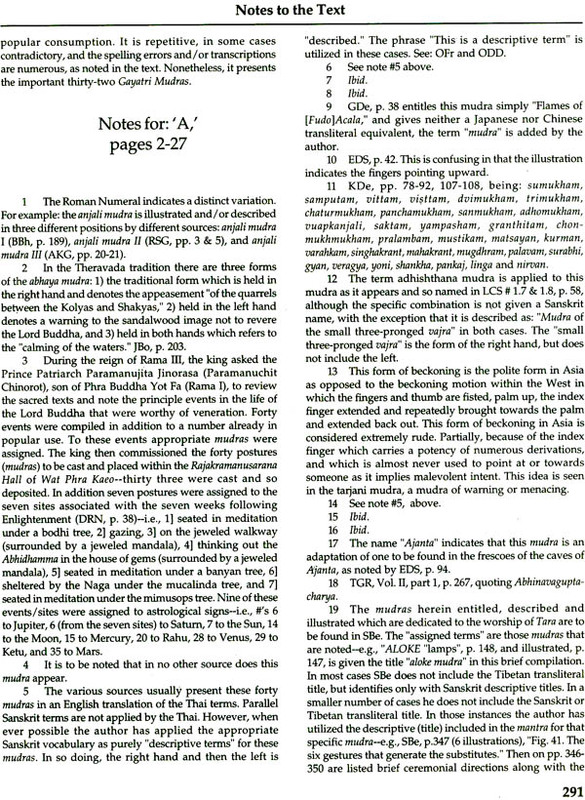 There are two additional categories which are to be found herein001)" Descriptive terms" which have been assigned to the forty mudras compiled by the Prince Patriarch Paramanujita Jinorasa (Paramanuchit Chinorot), and 2) "assigned terms" from the fifty-seven mudras illustrated in: Stephan Beyer, The Cult of Tara: Magic and Ritual in Tibet. Other problems are found in both GDe and LCS in which mudras are presented which are associated with different deities and of which not common is given-e.g., Sachittotpada-Bodhisattva mudras or Dharmachakra-pravartana-bodhisattva-vrga-mudra. A number of the drawings in the two above cited works were ill-conceived, poorly drawn-e.g., LCS, p. 113, #2.161 in which the left hand is shown with a thumb and five fingers! This, of course, is not the fault of the authors. However the presentation of such images, especially, those in which careful delineation of the various fingers is not possible, does place the viewer / reader in a quandary. Finally, all this being said, in such a compilation, errors may, inadvertently occur. For those errors and/or omissions the author apologizes and invites any correction or addition. 216. jo fudo-in (mudra) 92. 217. jo-in (mudra) I 93. 218. jo-in (mudra) II 93.